Club Patio is a premium Hotel nestled in the Block E of South City I, Gurgaon. The Hotel is located at a distance of 2.4 km from its nearest metro station- Huda City Centre, the terminal station on the Yellow Line of DMRC. One can easily reach the venue through a 9-minutes drive from the metro station. Club Patio is one of the best luxury hotels in Gurgaon! The Hotel provides you with multiple event spaces for your different types of events, including both indoor and outdoor. 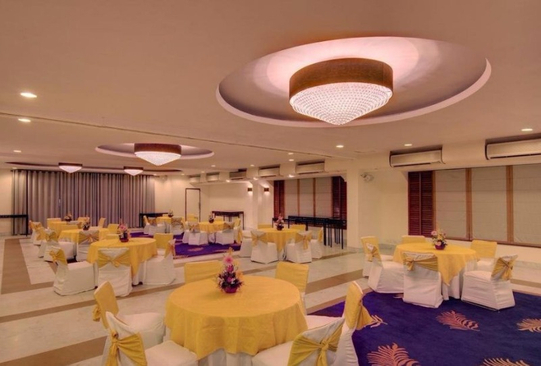 The venue offers multiple Banquet Halls with plush and sophisticated ambience for your indoor events, a sprawling lush-green and well-manicured Lawn for your outdoor ones, and a flawless poolside area with a fun & frolic atmosphere. Each of the celebration area of this venue is full to the brim with sheer exquisiteness and provides a gorgeous set up for your events. The venue provides you with an in-house decorator to set up your desired theme for the event into the venue. Club Patio provides you with an on-site team of culinary chefs for your events. The venue serves a gourmet range of lip-smacking vegetarian and non-vegetarian food items from an array of cuisines both local and global. You can choose amongst the venue's multiple buffet-options including High-Tea Menu, Social Functions Menu, and Wedding Menu. For you cocktail events, Club Patio also serves a wide variety of alcoholic drinks. A luxurious stay is also provided by Club Patio to ensure maximum convenience of your outstation guests. Club Patio is an ideal venue for your multiple types of events including Anniversary Celebrations, Birthday Party, Cocktail Party, Corporate Party, Engagement Ceremony, First Birthday Party, and all your Pre-Wedding Functions, Wedding Ceremony, and Wedding Reception. Nice and comfortable space for your events. I personally liked the pool very much!! Excellent service and amenities. Good option for your events..I attended my neice's first birthday party here. Great set up and food! Stayed here for two nights during one of my corporate seminars here. The rooms are cosy and clean, all the necessary facilities were available too. We had booked the hall for our event. The interiors were classy and they'd set up the theatrical seating in the hall. The food was really nice too, they had a multi-cuisine buffet and it tasted good. The service was also great!